Yesterday morning I drove Lyda back to the airport and after a quick call to Ikea, McDonalds (a girl’s got to have some junk food ocassionally doesn’t she??) and the library in Carlow I returned home to Clasheen ready for a hot bath and bed. I am physically tired but mentally exhilarated after our weekend workshops and I am so looking forward to getting silly household chores out of the way so that I can start laying out some samples for my newest felt project. I still have to finish fulling my complex felt sculpture but that is on hold for a couple of days until I get the house tidied and the well (STILL no water of my own) back in proper working order. Now on to the ‘Felted Accessories’ workshop with Lyda on Friday. 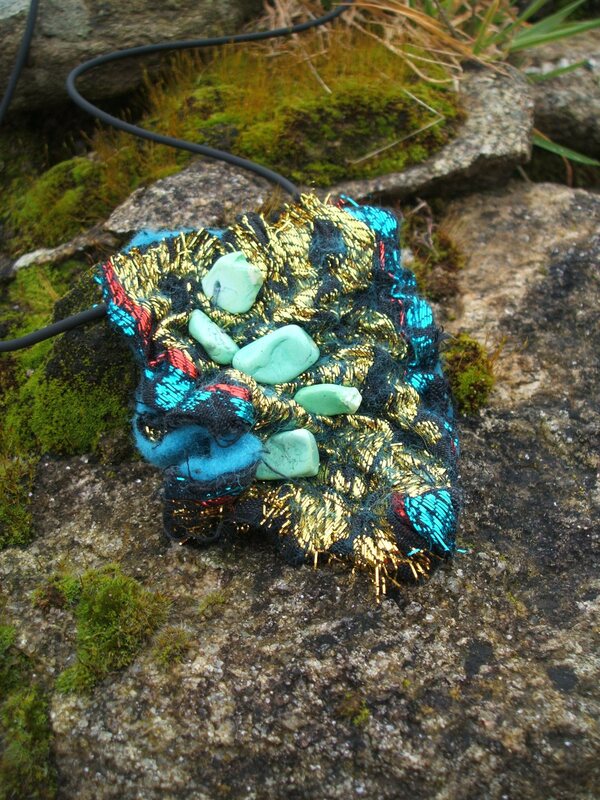 We started the morning oohing and aahing over some of Lyda’s beautiful scarves and inventive felt jewellery. These fun pieces of jewellery gave us the freedom to discover how different colours, fibres and fabrics combined together without the stress of laying out a bigger project and it was very satisfying to have a gorgeous felt accessory at the end of each experiment! Lyda encouraged us to incorporate artifical fabrics into our layout and these had some amazing results in the finished felt, you either loved each piece or you hated it, no middle ground! During the morning I suddenly remembered that I had a large artificial fabric wrap donated to me by a friend to repurpose and the metallic weaving combined with black was perfect to cut up into pieces to see what the result would be if it were felted into a background of short fibred merino. As you can see from the picture on the left it formed a good bond with the wool fibres and crinkled nicely during the felting process! I thought it was interesting the way the mixed fibres in the weave affected the finished shape. My lay out of wool and fabric for this piece was square but as I felted them together they shrank very much more in one way than the other. This ended up as an interesting twisted rectangle shape which I further embellished with turquoise stones and strung on a black rubber tube. My brief to myself over the weekend was to try our new things, to stitch or bead some work and to complete some projects and not leave them on the long finger for finishing later, whether you like this piece or not it is finished and it is beaded! Argh, I am so annoyed and frustrated because when I uploaded this post for some reason the second half of my writing and the image to accompany it was deleted. I don’t know what actually happened and unfortunately I have to rush to the bank so don’t have time to write any more right at this minute. I will however leave you for the second time, this time with a picture of my merino, stone, fabric and bead pendant minus the longer and more instructive description! This entry was posted in Felt, workshops and tagged accessories, Felt, felt jewellery, felt necklace, felt pendant. fibre, felted accessories, Felting, fiber, Lyda, Lyda Rump by Nicola. Bookmark the permalink. 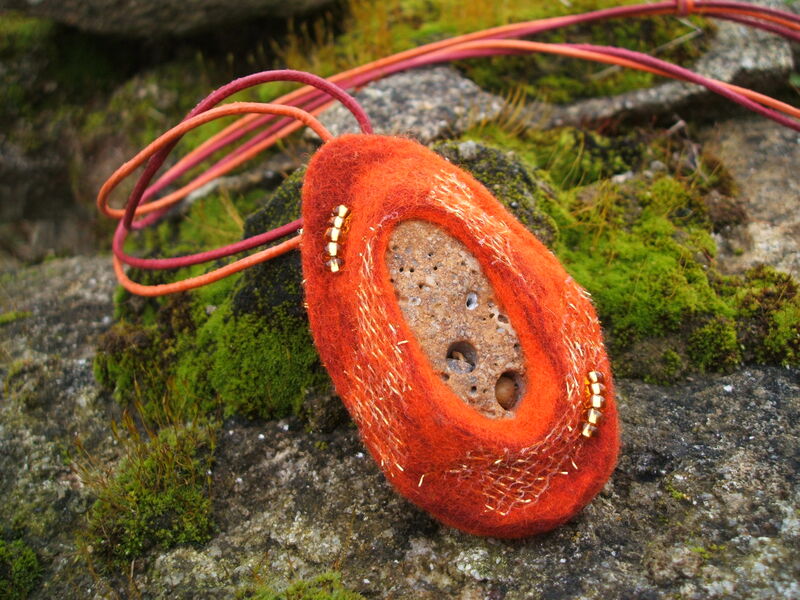 The stone pendant is gorgeous – please do leave instructions on how to felt something similar! Hi Nicola, this is lovely. Thank you so much for sharing.